Cheers to Friday! I’m celebrating just making it through the week lately. 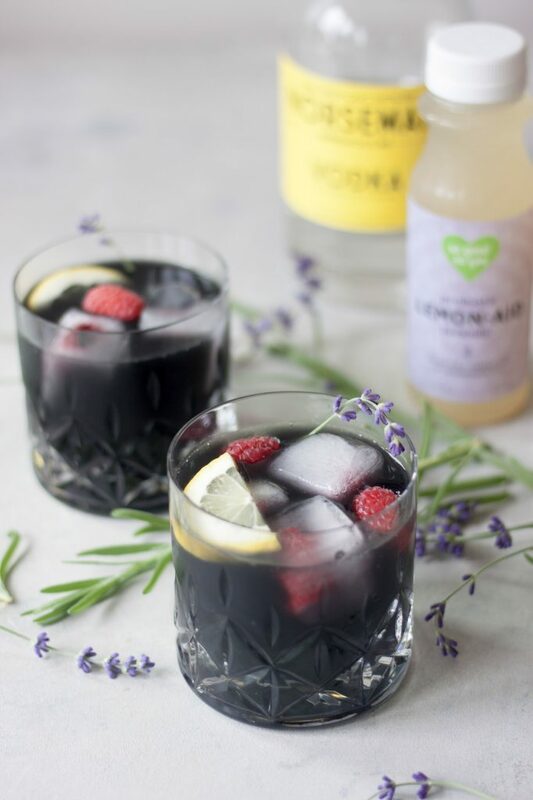 Enjoying a Black Lavender Lemonade last weekend realized it is National Lemonade Day this weekend and this delicious drink (even made into a healthy cocktail, shown) would be the perfect way to celebrate! Yes I know you’re probably thinking black again and thinking maybe I’ve lost my mind as I’ve posted black foods in the last couple weeks. No I’m not going to the dark side, where ever that is, but playing with dark foods came when I was going to make a face mask with activated charcoal I bought at Christmas time to make black “Coal” sourdough as a joke for Christmas. I realized it would be perfect to make a black ice cream which I think looks really cool, especially with edible glitter. I hadn’t planned on posting that recipe as I just made it for fun but it was delicious and I got a lot of requests so the recipe for that will be posting Monday as I thought it would be perfect to enjoy with the Solar Eclipse! So with that my fun for black continued and I decided to make this cocktail to sip anytime, but even more fitting to enjoy for National Lemonade Day on the eve of the Solar Eclipse. So really it’s a galaxy and just fun thing and nothing depressing, goth, or mood changing on my end. It really makes edible glitter pop and in these drinks perfect contrast for bright red berries and lavender flowers. 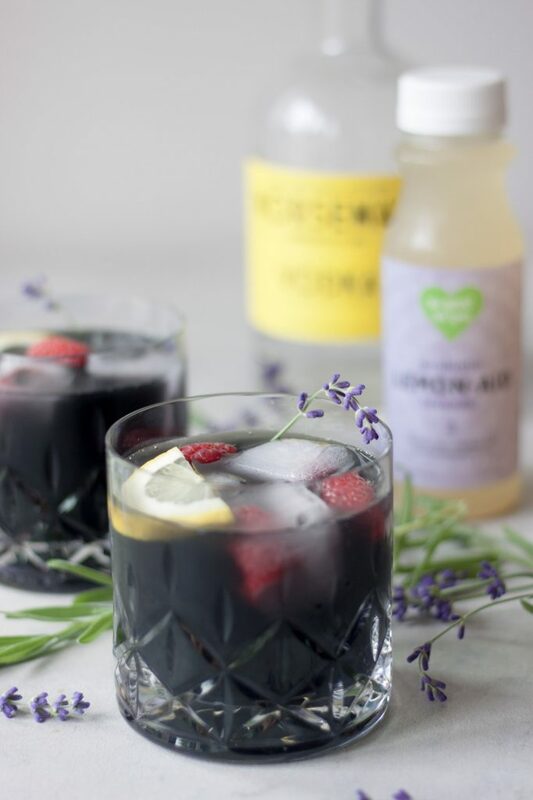 You can make your own lavender lemonade, pretty simple and I’ve done it in the past, but I decided to use Juice So Good Lavender Probiotic LemonAid for a little healthy probiotic boost and to make it quick and easy. 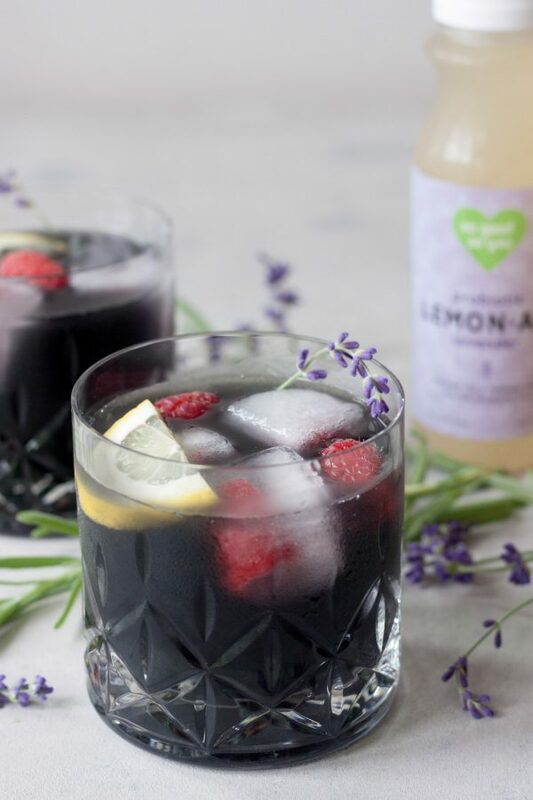 Made into a simple drink for sipping with lunch or in the afternoon or add a little local vodka to make a healthy Black Lavender Lemonade Cocktail to sip out on the patio by the fire enjoy the summer evening before these summer nights fade away. While I realize activated charcoal isn’t in make kitchens out there you can omit, or even add a little blueberry or acai juice however you won’t get it as dark and might be a little more purple. I’ll be testing it this morning when I pick up some more Lemon-Aid after barre and will update the post. So I did try to make it with acai and blueberry juice and both were more purple than black. I know some people do have it, it’s very inexpensive on Amazon (where I purchased it). As I said I purchased it for that coal bread for Christmas and while I wasn’t sure what I would do with it after I had heard it was used in many DIY beauty treatments like face masks, which is what I intended on using it for. The bag however came and was MUCH bigger than I thought it would be so finding fun little ways to use like this Black Lavender Lemonade or the Black Ice Cream posting Monday is exciting. As for safety, again I a not a doctor and I always encourage you to do your own research before consuming new things. If taking medications it can interfere with them so if you are I would double check as you wouldn’t want to interfere with them being absorbed and working properly. That said it is a very small amount and I don’t use it for anything other than natural coloring. I did use pills a few times while in Ireland years ago to help with tummy problems from consuming dairy while I was there as it is suppose to help and it did for me but only used them while I was there. How are you celebrating National Lemonade Day? Are you watching the solar eclipse next week? Fun and flavorful lemonade with a healthy cocktail option. Can be made with homemade lavender lemonade or prepared as called for in this recipe (one used also has probiotics). Fill two cups with ice, if making a cocktail pour in vodka. In a shaker cup, or you can stir it or blend it, mix lavender lemonade and activated charcoal. 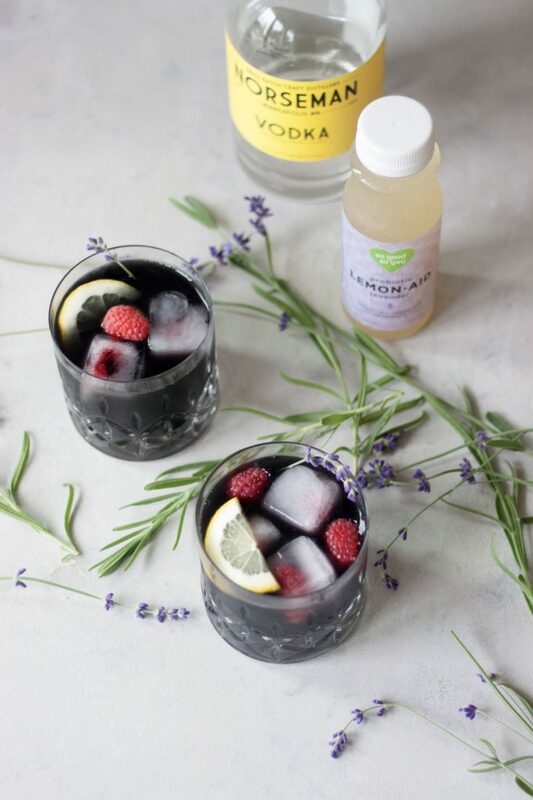 Garnish with fresh lavender, raspberries, and or lemon slices. Like it? Pin it (multiple pins) for later! I’m not sure I would have bought it had I not made the coal bread for Christmas but having fun with it. My oldest loves it in DIY face masks. Looks delicious, but I personally think I would skip the charcoal. It does look pretty cool, though! Thank you. I just happen to have it so fun way to use it but can’t go wrong with a lavender lemonade as is or in a cocktail without it. That lemonade looks so refreshing! I love that you added lavender! I didn’t add the lavender, although we’ve made our own lavender lemonade in the past, this is a probiotic lemonade I’ve been loving this summer since it came out. Looks like the perfect cocktail to end the week with! Charcoal is one of the latest trends I’ve been seeing everywhere. I first had it a couple years ago in Ireland, then in a drink 2 years ago in Boston. I probably wouldn’t have made it had I not had the charcoal from making bread to use up. It’s fun though! ohhh I haven’t tried charcoal before! but coal sourdough is just hilarious! love this. happy lemonade day!!! It was so fun at Christmas and I’d do it again. I tried a lavender lemonade at the farmer’s market last weekend & it was so good! Very refreshing! It’s so good and a nice relaxing twist. This looks so refreshing! Sadly I am fresh out of activated charcoal! I need to get some stat! Haha, not many people have it but if you do it’s fun! Have fun at your birthday lunch! My youngest will be at a birthday party watching it Monday. Yum! This looks like such a delicious and beautiful cocktail. Perfect for Summer, I will have to try it out!!! Thank you, summer is fading fast so enjoy all the moments while you can! Such a creative lemonade idea! Sounds perfectly refreshing for a hot day! Thank you, it’s really refreshing and perfect for sipping on the weekends! Like I mentioned on IG, this is such a pretty drink! I’ll have to try my hand at making one! Thank you! Love to hear what you think if you do Carmy! It really is, thank you Dixya!